﻿Published by Sareth Ney on May 17, 2016 at 3:07 p.m.
DAYTONA BEACH, Fla. – Laughs by the Beach returns to the Bank & Blues Club, on May 19. Sareth Ney, Mike Pantzer, Ian Perna and Wu-Man Chu are the special guest comedians. Mike Lee is the featuring act, Devin Siebold is the headliner and it will be hosted by Peter O’Keefe. Sponsors include Willie’s Tropical Tattoo and WROD 104.7. It is presented by Deathsquad Florida and Pantzer. Tickets are priced at $10 each and are available at brownpapertickets.com. The price excludes service charges and fees. Lee is a morning show host in central Fla., comedian and producer. His official website can be accessed by clicking here. To like him on Facebook, please click here. To follow them on Twitter, please click here. To subscribe to their channel on YouTube, please click here. Ney has a superhero alter-ego, Wu-Man Chu, and a music and comedy festival in Colo. To visit his website, please click here. To like them on Facebook, please click here and here. To follow them on Instagram, please click here and here. To connect with him on LinkedIn, please click here. To follow them on Twitter, please click here and here. To subscribe to their channel on YouTube, please click here. O’Keefe supports Deathsquad Florida, master of ceremony for shows, events and festivals. His Instagram profile can be followed by clicking here. To follow them on Twitter, please click here and here. Pantzer is from Pittsburgh, an actor and resides in Daytona Beach, Fla. Please click here, to visit his official website. To like him on Facebook, please click here. To follow them on Instagram, please click here. To connect with him on LinkedIn, please click here. To follow them on Twitter, please click here. To subscribe to their channel on YouTube, please click here. Perna is a former Navy veteran and performs stand-up comedy throughout Fla. Follow him on Facebook, by clicking here. To follow him on Twitter, please click here. 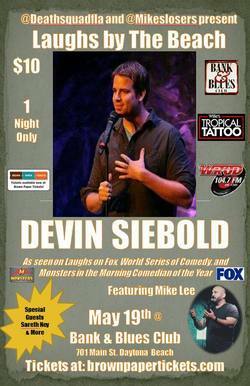 Siebold can be seen on Fox, World Series of Comedy and more. His official website can be found by clicking here. To like him or follow him on Facebook, please click here and here. To follow him on Instagram, please click here. To subscribe to his RSS Feed, please click here. To follow them on Twitter, please click here. To follow them on Vine, please click here. To subscribe to their channel on YouTube, please click here. Contains explicit language. Viewers discretion is advised. May 19 - Bank & Blues, Daytona Beach, Fla.
May 28 – Tanner’s Lakeside, Winter Haven, Fla.
June 03 - Winners Circle Sports Bar, Lakeland, Fla.
Thursdays – Winers Circle North (Open Mic Host), Lakeland ,Fla.
May 18 - Orlando Improv, Orlando, Fla.
May 19 - Bank & Blues Club, Daytona Beach, Fla.
May 26-29 - Side Splitters Comedy Club, Tampa, Fla.
June 10-11 - Comedy Zone, Fredericksburg, Va.
June 16 - Daytona Beach, Fla.
June 22 - McCurdy’s, Sarasota, Fla.
June 30 - Maliblue Oyster Bar, Lido Beach, N.Y.
July 6 - Coushatta Casino Kinder, La. July 8-9 - Comedy Zone, Charleston, S.C.
July 15-16 - Comedy Zone, Johnson City, Tenn.
July 18-24 - Comedy Cabana, Myrtle Beach, S.C.
Aug. 01-06 - Comedy Zone Lake Norman, Augusta, Greenville, N..
Aug. 11-13 - Laugh In Comedy Café, Fort Myers, Fla.
Aug. 18-20 - Gregory’s Comedy Club, Cocoa Beach, Fla.
Oct. 06 - Fire Expo, Fort Lauderdale,Fla. Nov. - Harrison Ranch, Parrish, Fla.
Dec. 14-17 - Visani Comedy Zone, Port Charlotte, Fla.